I spent about 30 minutes today working on a little task that probably did as much to increase our safety and security here aboard Eagle Too as almost any of the many other improvements we’ve performed in the last few years. What was it, you might ask? Well, I’ll show you. 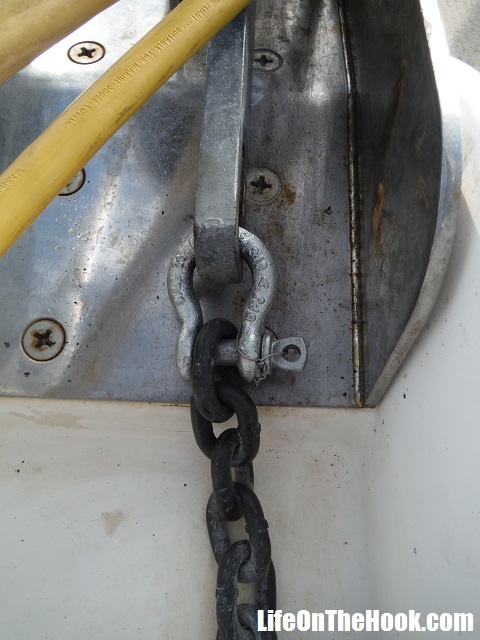 If you own a boat, you know how vital a good anchor and a robust anchor rode (chain and/or line that attaches the anchor to the boat) are. When you’re sitting at anchor and the wind picks up or a storm passes through, your boat’s safety is completely dependent on the ability of your ground tackle (anchor, rode and associated components) to hold up. A 20,000 pound boat like ours, being battered by 40 knot winds, can create hundreds, even thousands of pounds of force yanking on the anchor. 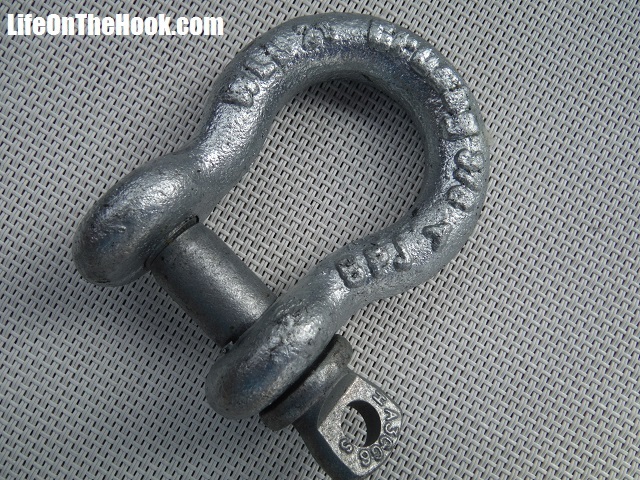 But even though we carry a two-sizes-too-big anchor and almost 300 feet of high-test (G4) chain, I’ve always been a little concerned about the weak link in the system, the piece that ties it all together—the shackle. When it comes right down to it, no matter how over-sized your anchor or robust your rode, that little link of cast metal is all that stands between you and being dashed against the shoreline in a blow. The problem is that not all shackles are created equal. 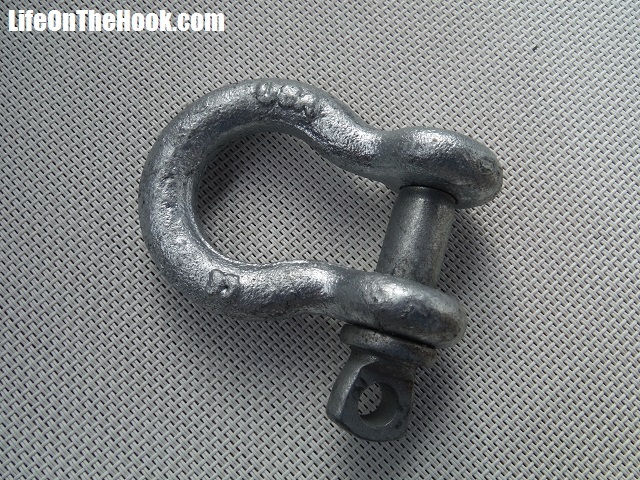 The 3/8ths shackle we’ve been using for the last few years was one we picked up at West Marine for about $5. If you look closely, you’ll see that the shackle is stamped WLL1T. This means that it’s rated for a working load limit of one ton. Now a ton might sound like a lot. 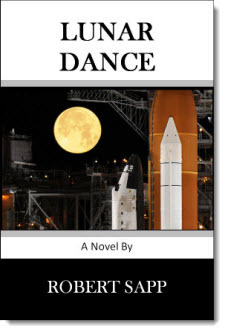 But when a really good blow gets the boat sailing around at anchor, jerking up short on the rode as it completes each arc, the shock loading can be pretty intense. It’s a bit hard to make out in the photo, but this shackle is stamped WLL2T. Same size shackle, but rated for twice the load of the previous one. Why the difference? Pretty simple really. Let’s look at the other side. The new one is stamped “USA”. Now go back and take another look at the first one. You’ll see that it’s stamped “China”. And that’s all you need to know. 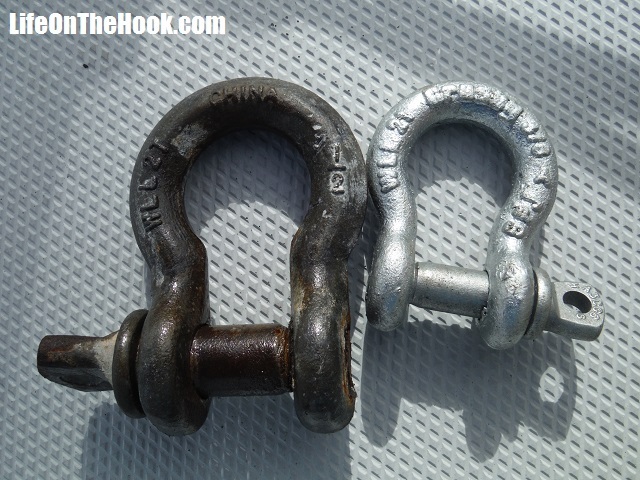 The new one is the same size shackle, but much better quality, resulting in twice the load rating. It’s a Crosby G-209A, which you can pick up from Defender for a whopping $15. Here’s another look at the issue. I dug though our parts box, and found another shackle onboard with a 2 ton rating. The one on the left is another Chinese made item, and is way too big to work with our 5/16ths chain. But even though it’s much meatier than the Crosby shackle on the right, they both have the same load rating! 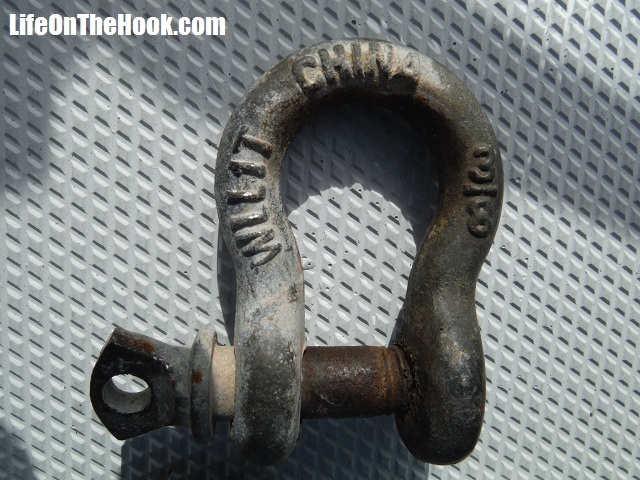 If all you ever intend to do is occasionally drop the hook to grab lunch, then any old shackle should do. But if your goal is to cruise, and you want to be ready for whatever Mother Nature might throw at you, then do yourself and your boat a favor, spend the few extra dollars, and just say no to cheap Chinese shackles. This entry was posted in What? and tagged Cheap Chinese Shackles, Crosby Shackle Review, Upgrade Your Shackles on January 16, 2017 by Robert. Great post. In addition, it helps to ask the question, “Who certifies what is stamped/embossed on the shackle?” That is, can I stamp anything on there I want? There are several interesting youtube videos of a company testing shackles. I’ll add that if the company that manufactures the shackle is a US company (like Crosby), chances are excellent that the shackle will hold up to the WLL stated (probably several times over, for the breaking strength). First of all, they publish the international standards that the shackles meet on their company website. Second, as a US company, they can be sued, so have a strong incentive to mean what they say. The chances of successfully suing a company in some places outside the US are about zero. They count on low cost to do the selling. Same is true of chain I assume. Do you know who made your chain? Our chain was manufactured by Acco, which is a quality US manufacturer, and our anchor is a Mantus, which is also US made. It was the Chinese shackle that was the weak link. I feel pretty confident now that the anchor locker cleat would rip loose before the rode fails. Always us Crosby Shackle – Galvanized Bolt Type (US Made) as these are the ones used in the oil field who have gone so far as to serialize and track them cradle to grave. The Chinese have tried to insert themselves with these inferior products for years. We bought several so that we’ll have spares.